I discovered this work in 2011, when browsing the graphic novel section at Central Public Library. Shawn Yap (creator & artist), Gabriel Chua, Nathan Peng, Daniel Barrett Lee, Xander Lee, Regina Lee, Amanda Yap, Beryl Kwok. The work was published under the Media Development Authority's First Time Writers and Illustrators Publishing Initiative (scheme has ended, it seems). Its creators were a group of young people, with half of them as co-writers and the other half as colourists. Most of them seem to be between 25 to 30 years old at the time of publication. According to the blurb, the work collects all six chapters published in M.U.G.E.N. and includes extra pages and revamped artwork. The story takes place in a fictional city called Central City. The protagonist is a detective who comes from a mysterious anti-crime family/ clan. The clan leadership is a hereditary title passed from fathers to sons. 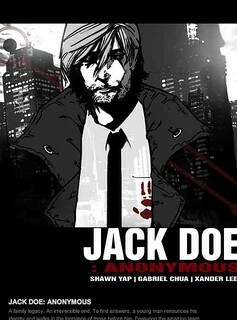 Upon taking over as leader, he loses all personal identity and assumes the anonymous title of Jack Doe. He exists to "protect the city from the shadows" by solving cases that "no one else can". 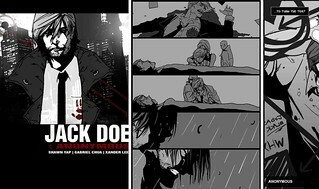 Jack Doe has no powers, other than possessing a pack of tarot cards as part of his crime-solving arsenal. 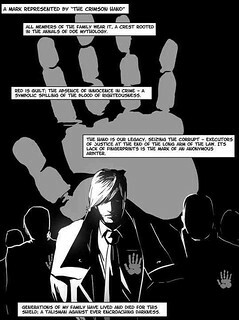 The graphic novel starts with a murder of Jack's friend, the police commissioner. The mystery deepens when Jack is pursued by people intent on killing him. There's a sub-plot that attempts to delve into Jack's psyche, his past, and his recurring dream where he sees himself murdered. Interesting premise. Their work attempted to weave a mixed genre of plup-mystery and hardboiled detective story, presented in an almost film noir style. The art work is good. What could be improved was the storyline, which had a few elements that were slightly distracting to the flow. For instance, being a detective with an office isn't quite anonymous. And with no apparent powers or abilities, the protagonist was pitched against super-powered beings. A bit of a tilt there for me. The hero never quite fights with any of the villains either, save one. Made me wonder what happened to the villains. A pleasant surprise for me was the twist at the end. They adapted a the "world within worlds" concept to set up for a clash between unexpected parties. I suppose they were working with tight deadlines, developing the story along the way. Which might have made the 'Reveal' a bit abrupt. Overall, the art and graphic flow was good enough for me to read to the last page. The artistic style used throughout the work was one of the more polished ones I've come across (kudos to the main artist is Shawn Yap, and not forgetting the team that did the inking/ colouring). The panel designs came together very nicely. You know something is professionally done when you don't notice the 'technical' aspects of the graphic novel and can focus on the story. For what my opinion is worth, I thought the work was good enough to be placed against the work from international titles. As a first time work, I'll give them a second thumbs up. More important, I am keen to read more of what they have to produce.